If you’re a quilter you may have started on a whim because of a quilt you saw in a book or maybe you saw one at an antique store. Or you may be one of those who has been quilting all their life. However it was that you began quilting, I’m sure you’ll agree it’s a quiet, peaceful pastime, but one that can also seem to be a bit complicated. I admit I’ve looked at quilt patterns before and marveled at all the amazing designs; I wondered how someone could put together such an assortment of color into such an intricate pattern. Quilt patterns that beautiful must take forever to make, I thought. I wondered if it would be worth the effort to unlock the mystery of quilting. Quilting enhances your cognitive, creative, and emotional well-being; this turns out to be especially true for senior citizens. The bright colors of the fabric used in quilting were found to be uplifting, the activity of quilting helps to relieve the stress of work and quilting even improves math skills and gives your confidence a boost. And we can’t forget the social side of quilting; when done in a group, quilting leads to people actually talking with each other face to face. Quilting brings people together and forges a bond. Quilters quilt because it’s a creative outlet and it lets you be part of a caring, creative community. However, there is no guarantee that the family and friends of these happy quilters will be in support of their peaceful habit. In fact, it may drive family and friends crazy, especially if said quilter takes over the kitchen table or the spare bedroom with her quilting projects. I have loved quilts for as long as I can remember. As a child, I slept under a Sunbonnet Sue quilt that my grandmother had passed down to my mother. My mother then passed it down to me, and I will someday pass it down to my daughter. The history of quilting probably goes back farther than any of us can remember; people have always needed something to cover themselves up with and keep warm. And so, the quilt was invented, though I’m sure the word quilt, which actually means stuffed sack, has not been around forever. The earliest known quilt is from 14th Century Sicily; but quilts might date back as far as the Chinese and ancient Egyptians. Today, quilting has morphed into an art form; some quilts are made for decoration only. They make beautiful wall hangings! Quilts hold something of an iconic position in our culture; the United States Post Office even came out with a series of quilting stamp. Way back in the 11th century, warriors used quilted fabric for extra padding and protection inside their suits of armor. The oldest known quilt that’s still around is called the Tristan quilt; it resides in the Victoria and Albert Museum in London. The art of quilting was brought to America by the settlers who came here from Europe, and the earliest surviving American pieced quilt is the Saltonstall quilt from 1704. The quilting bee came into being shortly thereafter as a way for women to get together, talk and make quilts for the long, cold winters. As the settlers moved westward, quilting spread across America. Today, most of us don’t make our quilts, we simply visit the bedding department of our local department store. 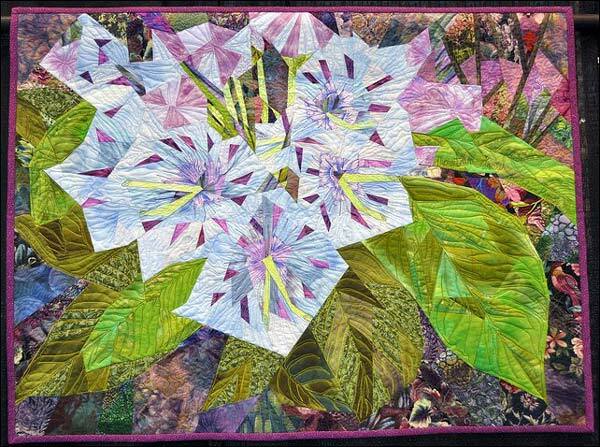 But the art of quilting is alive and well and has become a favorite hobby for many. A study published in 2010 estimates there are 21 million quilters in America; and their numbers are growing. I attended several quilt shows to marvel at the amazing handiwork of quilters and to feel the energy of all that color and design. While hanging around quilters, I picked up some history and some quilt lingo. Stash: That pile or piles of fabric you have hanging around your sewing room. 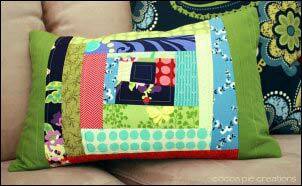 Scrappy: A quilt made with fabric scraps, maybe the ones you have in your stash. 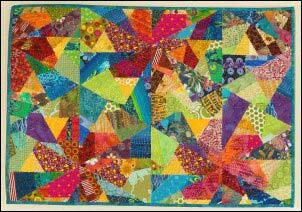 Strip Piecing: A quilt made by sewing together rows of fabric, then cut to re-piece in different ways. Warp: The long threads that run the length of the fabric. Weft: The shorter threads that run across the fabric. Quilters also have lots of quilting tools and gadgets; some of which may never be used in the making of a quilt. If you decide to start quilting, some of the tools you might need are: rotary cutter, quilting ruler, sewing machine, thread, pins, a good pair of scissors, and of course, material, material, material. Popular since the Victorian era, these quilts look exactly like their name; they are squares of fabric sewn together in rows, each square is stuffed with cotton batting or whatever else is on hand. Maybe they were called biscuit quilts because the puffy squares resembled biscuits. 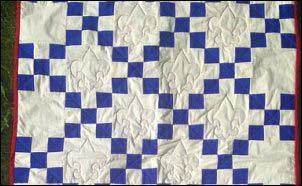 Many times, these quilts were made with satin or velvet; just what you would expect from the Victorian era, right? Puff quilts made a comeback in the 1970’s when the recycling movement was just getting started. People who made puff quilts stuffed them with things like old nylon stockings and bits of leftover fabric. The mainstream consensus of the time said that puff quilts were impractical at best; too heavy to sleep under and too puffy to lay on. Those in the know say that taking up quilting can make you happier; but not if you had to sleep under a puff quilt. When I first heard of a crazy quilt, I was not at all sure what it meant; I was skeptical and a little afraid. Had women actually been driven crazy by quilting, I wondered? I believed, after looking at some of these intricate quilting patterns, that one could indeed be driven crazy attempting to make one. I doubted that any one person could make, with their own hands, something so amazing. When I saw my first crazy quilt, I stood and stared at it for quite some time. The thing wasn’t scary at all, but it didn’t look like any of the other quilts in the show. The crazy quilt is all about different pieces and shapes of fabric all stitched together in a ‘crazy’ sort of way. All of a sudden the name crazy quilt made sense. Those who knew the ropes explained to me that crazy quilting mostly refers to the art of crazy patchwork. It’s all about just doing your own thing; crazy quilts don’t have a pattern. The big difference in these quilts and the more conventional kind is that there are no repeating motifs, and the seams around the patches of material are showier. Crazy quilts, unlike others, can be embellished with beads or buttons, or whatever feels right. When you look at a log cabin quilt pattern, you won’t see a log cabin. The pattern is symbolic of the cabins that dotted the prairies of the new frontier, and it remains one of the most popular patterns of all time. There are lots of variations to the pattern and it’s said to be the quintessential American quilt pattern. I delved a little bit into the history of this pattern. It’s one of the most popular patterns and has been from the beginning of quilting. It retains its popularity today and is made by experienced quilters as well as those still wet behind the ears. The earliest log cabin quilt dates back to 1869, and the pattern has been found all over the world, from Egypt to France. There are many variations of the pattern, but it’s basically strips of fabric sewn in sequence around the sides of a square. Baskets have been a mainstay in many peoples’ daily lives, today and for centuries past. It’s no surprise that basket quilts became popular and still are to this day. They started off as whole cloth quilts with the basket motif appliqued on them. This kind of quilt isn’t made by cutting and piecing material together but instead is made from just one piece of material for the quilt top with one of more baskets appliqued onto it. These quilts were a way to show off a woman’s handwork abilities. The 9-patch pattern is one of the best for learning the art of piecing. The basic pattern is simple, being only blocks of 9 patches each, but there are a myriad of ways the patches can be placed. The 9-patch quilt is a good way to teach a child to sew while teaching a bit of history at the same time. Nine patch quilts have been made since the beginning of the 19th century. The quilts of those days are not dull in color as many people think but are delightfully bright in color. Historians are not sure if Irish Chain quilt patterns came from Ireland or not. There is evidence that it was developed in America in the early 1800s, and some historians say it has its beginnings in Ireland. But it’s virtually impossible to trace the exact origins of any particular quilt pattern. What is possible is that an Irish woman named Margaret Kee brought the pattern to West Virginia when she emigrated from Ireland in 1807. The Irish Chain is great for beginning quilters. It has no triangles or bias edges to deal with; it’s all strips and squares. The design can be made in single, double or triple chains. The world of quilting is amazingly diverse. Little did I know how many ways there are to quilt. I discovered free motion quilting, again I felt that familiar feeling of confusion as my mind tried to piece together what that might mean. Free motion quilting is the technique of using your sewing machine to make freeform wavy patterns on your quilt. It is also called stippling and can be done by hand or by machine. It looks really neat and can be a lot of fun. This type of quilting is a great way to use up some of your scraps in that ever-growing stash pile. You begin by printing out templates that have numbers on them and piecing them the same way as you would with material. It’s kind of like paint by number. You then machine stitch your material directly onto the paper; it’s ideal for quilts that have a lot of small blocks with intricate angels. Paper Piecing or Foundation Paper Piecing, also known as FPP, will ensure that your points and angles will be exact. 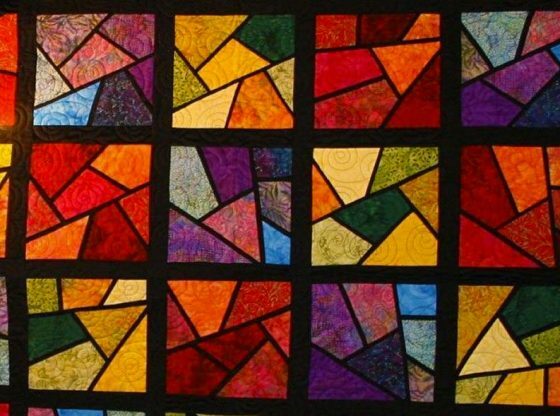 Stained glass quilting is basically an applique method, but it takes applique to the next level because it includes a special bordering effect that mimics true stained glass. When done right these quilts have the look of intricate stained-glass applique and are quite striking. It’s been said that these quilts, made by African Americans who were descendants of slaves, may be the most famous quilts in America. Gee’s Bend is a tiny hamlet in the southernmost part of Alabama that’s connected to the outside world only by an unreliable ferry and one very muddy road. For generations, the people of Gee’s Bend have quilted and lived in isolation from the rest of the world. When their quilts were finally discovered, their designs took the world by storm. The world had never seen such quilt patterns. They were innovative and bold. The quilts made the rounds of museums and then began to be marketed. The rest is history. If you ever decide to make a quilt, beware of the “Martha Stewart Syndrome.” That’s the feeling that comes over you when you sit down to do a craft, any craft, and you suddenly feel like you aren’t good enough. Thoughts like “Who am I to think I can make a quilt?” will meander through your mind. You’ll start to think about all the amazing things you’ve heard or read about that Martha Stewart can make. “The woman seems to ooze creativity,” you think. Then you look at your material and the quilting tools and gadgets you’ve bought, and you start adding up the money you’ve spent. You look at the beautiful material you just bought, and you’re gripped with fear. “How can I possibly cut into it? What if I make a mistake?” You say to yourself. Many quilters have been stymied and held back by such thoughts. But just remember this: Our foremothers made all of their quilts by hand from fabric scraps. They made them without the aid of any special tools or gadgets; just their two hands, a needle and some thread. There were no sewing machines. There were no fabric stores. There were no YouTube videos to watch. The frontier women of yore had to either teach themselves to quilt or remember what their mothers had taught them. And yet they forged ahead fearlessly, knowing that the quilts they were making would go a long way in keeping their families warm in the long, cold winters on the prairie. Despite having to deal with all the things we would call setbacks and hardships today, our frontier foremothers turned out some awesome quilts.